What Are Islam Beliefs and Practices? I live in Indonesia, a country which is home to more than 200 million muslims. I did not accept Islam since birth (although that probably isn’t possible anyway 😉 ) so I tasted a bit about Protestant Christianity when I was a kid. I live in a heterogenous family: although my father is a muslim (and his family), my mother is a Protestant, and my sister was a Protestant before she converted to Catholic when she got married to her Catholic husband. During elementary school I embraced Islam fully. So I’m a living proof of what religious tolerance really is. In my view, especially in the religions of the people around me: being tolerant is dependent on the person’s personality, not because of religion. I’ve had my share of debates and quarrels with members of my family and extended family, and also among them, however 99% of them are because of personal matters, economy, and other worldly issues. The few cases where we’re discussing differences between religions, it’s always in leisure friendly setting, and then we moved on. So my conclusion is, if you find people that are harsh and intolerant, even if he changes religion many times he will still behave that way, unless he changes his personality. Ok, so no one is forcing you to convert to Islam. But maybe you’re interested to learn the basics of what Islam is really about. At the core, is Islamic beliefs and practices. There are 6 core beliefs of Islam that a muslim must accept if he/she wishes to convert to Islam. This is also called Islam’s pillars of iman. Believe that there is no God but Allah. Believe that Allah created angels. Nobody living today has ever seen an angel, but if you believe in angels, it’s one requirement for converting to Islam. Belief in His messengers, including the 25 notable ones: Elishia, Job, David, Dhul-Kifl, Aron, Hud, Abraham, Enoch, Elias, Isa (Jesus), Isac, Ishmael, Lot, Musa (Moses), Nuh (Noah), Salih, Shuaib, Sulaiman (Solomon), Ezra, Jacob, John, Jonah, Joseph, Zachariya, Muhammad. Believe that Allah descends holy books for His messengers, and the 4 notable ones are: Zabur (holy book of Daud), Tawrat (holy book of Musa/Moses), Injil (holy book of Isa/Jesus), and Qur’an (holy book of Muhammad). Belief in the Last Day. This world will end at some point, and Allah will raise all humans again from the dead to be judged based on their deeds while living. Belief in al-Qada (Divine will) and al-Qadar (Divine decree or pre-ordainment). Everything in this universe happens because of the will and decree of Allah, and He has complete knowledge of all events, past or future. Humans have free will, and the free will of humans are still within scope of Allah’s will and decree. This may be hard to understand fully. But you have a choice, you can accept a faith with or without a debate. If you accept this, you’ve checked one requirement for converting to Islam. There are 5 core practices of Islam that must be performed by muslims. Shahada. It is declaring oneself as muslim by saying “I witness that there is no God but Allah, and I witness that Muhammad is the Messenger of God” in Arabic and native language (such as English). When this is done in front of other muslims in the community, then you would have converted to Islam. And you begin your journey as a muallaf, a person newly converted to Islam, who is in need of extensive guidance from the muslim community. Becoming a muslim is not without challenges, and especially when Islam is not the majority like in the United States, the challenges are huge. That’s why getting help and support from the local muslim community is very important. Anyway, in reality shahada is performed multiple times a day (although in private), because when we do salah (muslim prayer) we always recite shahada. Praying five times a day (Salah). A muslim must perform prayer 5 times a day in specific manner. In a way this teaches discipline in life. However, Islam allows much flexibility if a person is having menstruation, sick or other acceptable reason. So for example, if someone cannot stand then he/she can perform prayer by sitting or laying down, this is not a problem. In addition to the 5 mandatory daily prayers, there are optional prayers that you can do, but still recommended. So just by this practice alone, there are several virtues to learn from: discipline, tolerance, and attention to quality. Giving charity (Zakat). You need to give a small amount of your wealth for charity. The extremely poor will be exempt from this, as they are the ones receiving the charity. Fasting (Saum). 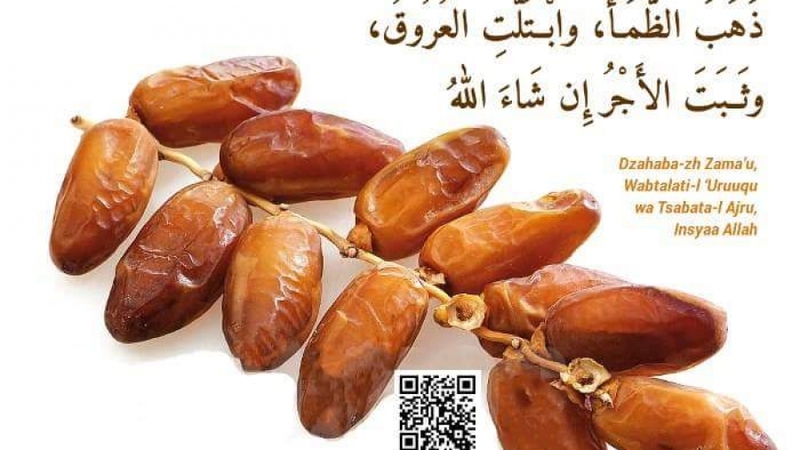 There is a whole month of Ramadan when muslims are mandated to fast daily from before sunrise to after sunset. This will be a challenge for new muslims, because it’s still a challenge even for those who were born muslim! Especially in the United States where fasting can last from 15 to 18 hours a day depending on the city and time of year. In Indonesia, fasting duration is mostly fixed at 13 hours a day. It is possible to perform fasting on regular days or on special days, either for practice or because it is a good deed. Pilgrimage to Makkah, Saudi Arabia (Hajj). The pilgrimage is different because it is more complex than the 4 practices above, and also because it requires effort and money that not all muslims are able to do this. But if a muslims has the means to perform pilgrimage, then it becomes mandatory for him/her. It has to be signified that nobody can force you to convert to Islam. However, it is a good idea to learn about Islam, so you can better understand what Islam is about, and you become wiser when responding to events that happen around you, such as media reporting of muslims, and so much. Islamophobia is a big problem, getting (mis)information from anti-Islam communities would increase this problem, so one of the best ways to solve this problem would be to know more about Islam from reputable sources. And as all muslims will agree and can confirm to you, in Islam the #1 reputable source of information is Islam’s Holy Book: Al-Qur’an. Al-Qur’an itself is in Arabic, it has not changed since the first time Al-Qur’an was bestowed upon Prophet Muhammad. You’ll need a translation of Qur’an which is easy to understand. 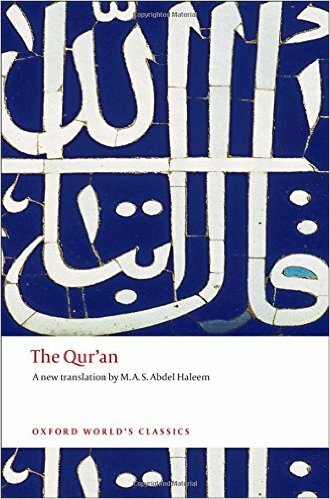 The Qur’an by Oxford World’s Classics receives a lot of rave reviews because its translation uses modern plain English that is easy to understand. This is very important because you do not want to misinterpret the meaning of a verse, which can cause confusion. In addition, Haleem provides a general introduction to Islam which will be useful for anyone new to Islam. Al-Qur’an is not an incredibly thick book, it definitely has much fewer pages than Injil (Bible). I suggest you to read Al-Qur’an several pages at a time, and you can finish the whole book in only a few weeks. By then, you will have known the core of Islam teaching. You can also read Qur’an for free at Quran.com. 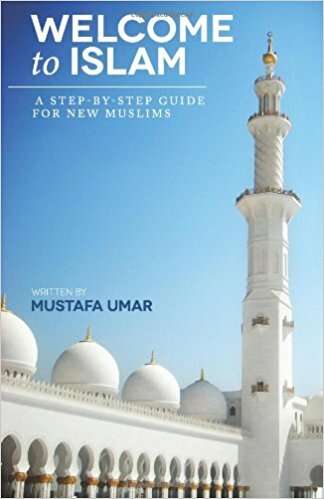 If you want to convert to Islam then you can read this book on how to become a muslim, which shows you what you need to after being a muslim. It will show you how to perform daily prayers, fasting, and one of the most important things is how to cope with challenges of being a (new) muslim. Getting support that can help you is very important. Because there are things that can make life as a muslim difficult, including in America. Islam is the religion, the belief, and the teachings. However, there are many different kinds of muslims: they are the communities, the people. And with people comes human nature, most are good but some are not that good. There are good muslims and bad muslims. There are helpful, knowledgeable muslims and there are ignorant muslims. So again it’s very important that you get help and support from a positive, helpful muslim community. One such community I know of is SacredLearning.org by Dr. Husain Abdul Sattar, MD in the Islamic Center of Chicago (ICC). You can follow and listen to their weekly gathering/talks as live streaming broadcast. You can also contact them if you live near the area and would like to learn more about Islam. If you’d like to know a muslim community in your area, leave a comment mentioning your city in the comments, and I’ll try to help you find a muslim community that I think can help you. About the discussion in the comments, I’m aware that this topic may feel controversial to some people, but my hope is to help people who sincerely want to learn about Islam. Please keep the discussion friendly. Although you’re welcome to voice your opinions, I reserve the right to remove comments who are offensive or make others feel uncomfortable. 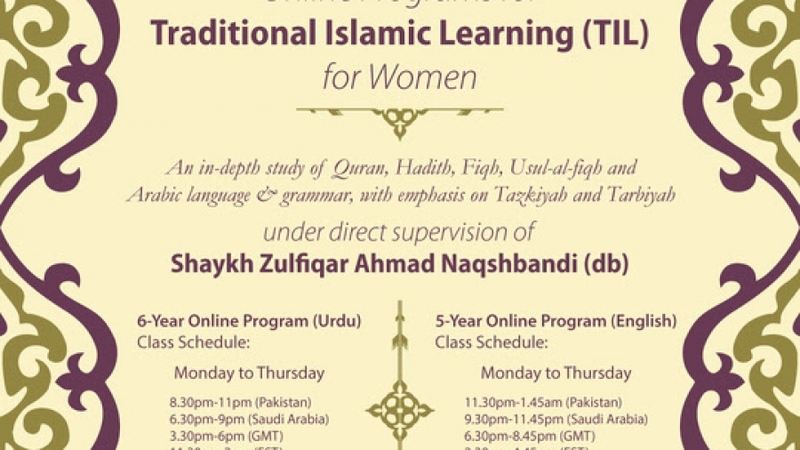 Do you want to learn about Islam? What do you think about muslims in your community? Let me know in the comments. Sebagaimana yang banyak diberitakan, kota Pekanbaru serta beberapa kabupaten di Riau, diselimuti asap yang kian tebal. Menjelang siang, daerah berjuluk Kota Bertuah ini masih gelap. Kepala BMKG Pekanbaru, Sugarin, mengatakan jarak pandang di Pekanbaru hanya 500 meter. Sementara di Rengat, Indragiri Hulu, hanya 700 meter. “Jarak pandang paling buruk terjadi di Pelalawan, yang hanya 400 meter. Sedangkan Kota Dumai, jarak pandangnya terpantau hanya 700 meter,” Rabu (2/9/2015). Dinas Kesehatan Riau menyebutkan hingga kini sebanyak 9.386 orang terjangkit penyakit akibat paparan asap. Kepala Dinas Kesehatan Riau, Andra Sjafril, Sabtu, 5 September 2015 menyatakan, pasien mengidap penyakit berbeda akibat asap, yakni Infeksi Saluran Pernapasan Atas (ISPA) sebanyak 7.312 orang, asma 296 orang, pneumonia 290 orang, iritasi mata 485 orang dan iritasi kulit 903 orang. Berdasarkan Indeks Standar Pencemaran Udara yang dikeluarkan Badan Lingkungan Hidup Riau, kualitas udara berada dalam kategori tidak sehat hingga berbahaya. Berkenaan dengan perkembangan tersebut, yufid menggalang bantuan masker, logistik dan obatobatan untuk membantu saudara kita yang tengah dilanda bencana asap. Bantu mereka bernapas… semoga upaya anda meringankan mereka, mendapat balasan terbaik dari Allah. “Barangsiapa meringankan satu kesusahan yang dialami seorang mukmin di dunia, Allah akan meringankan kesusahannya pada hari kiamat. (HR. Muslim no. 2699). Target pertama, pengadaan 10.000 masker. Sisa donasi akan kami salurkan untuk logistik dan obat-obatan. Donasi akan ditutup hari Selasa, 15 September 2015. Jadwal setiap hari Minggu, pukul 13.00-15.00. 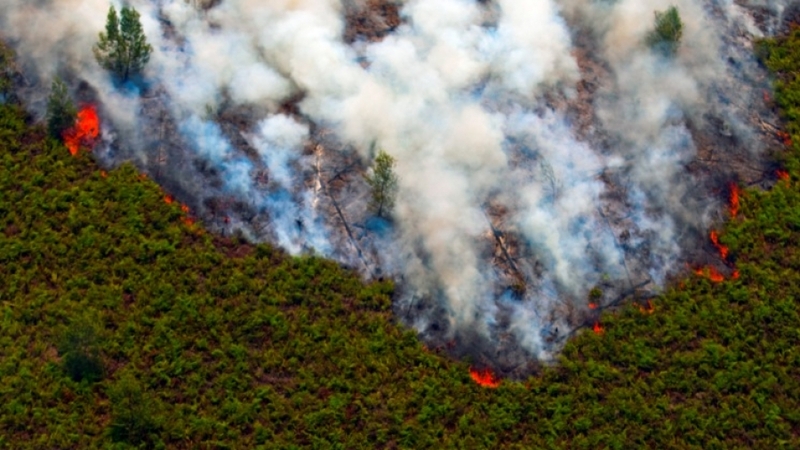 Mulai Minggu, 13 September 2015.
paling lambat Sabtu, 12 September 2015. 🙁 belum bisa datang langsung di jam kerja? 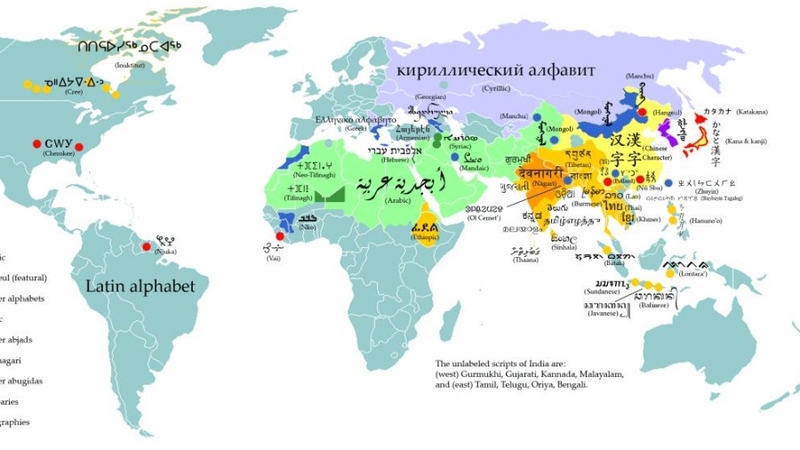 Masih berfikir kalau bahasa Arab itu sulit? Masih beralasan sibuk atau tempat belajar bahasa Arabnya kejauhan? Di BISA, insya Allah Anda bisa belajar bahasa Arab seru dan menyenangkan dalam genggaman HP Anda! Mari bergabung dengan komunitas pembelajar bahasa Arab terbesar di Indonesia dengan lebih dari 15.000 peserta dari berbagai negara telah bergabung! 2 bulan melek bahasa Arab insya Allah! Alhamdulillah sejauh ini program BISA telah meluluskan lebih dari 6000 peserta dalam dan luar negeri, dari aceh hingga papua, dari australia hingga finlandia. Dari remaja berusia 18 tahun hingga kakek nenek berusia 77 tahun. Dari petani dan pedagang hingga dokter, doktor, dan Profesor. 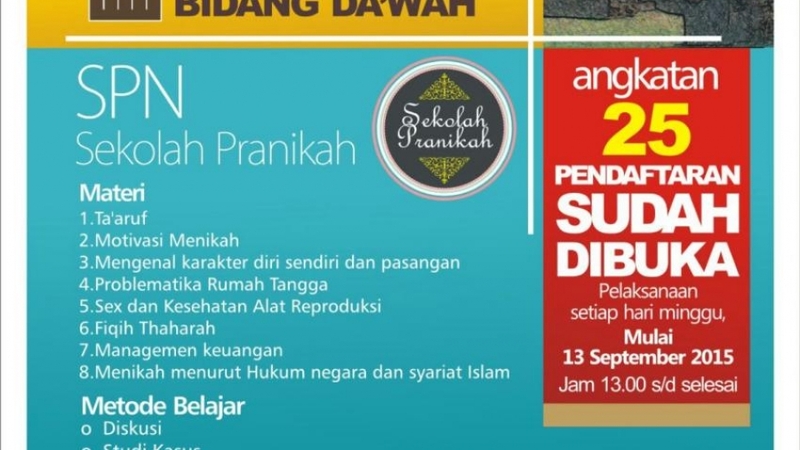 Pembelajaran akan dilakukan selama 8 pekan (2 bulan) dimana tiap hari Minggu pukul 16.00-17.30 WIB akan diselenggarakan muhadharah (pelajaran) via whatsApp yang wajib dihadiri oleh seluruh peserta (kecuali ada udzur). Wajib menghadiri muhadharah online rutin tiap pekan (Minggu Sore pukul 16.0-17.30) di whatsapp (boleh tidak hadir bila ada udzur). Wajib mengerjakan PR. Peserta yang sama sekali tidak mengerjakan PR pada pekan berjalan atau 3 PR dari beberapa pekan akan dikeluarkan atau di-drop out dari kelas. Setiap minggu akan ada 1 pr hafalan dan 1 pr tulisan. PR tulisan dikumpulkan melalui email. PR hafalan disetor ke grup whatsapp. Karena program ini gratis, bagi yang ingin ikut program ini, mohon berkomitmen untuk belajar sampai tuntas (2 bulan). Kami tekankan untuk tidak mendaftar bila hanya ingin coba-coba tanpa kesungguhan. 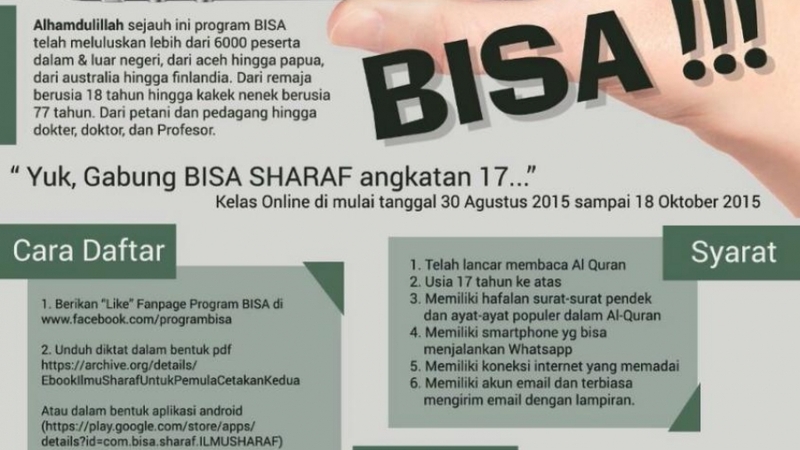 Karena program ini sangat selektif dan ketat dalam menegakkan aturan drop out. Untuk peserta akhawat yang bersuami, mohon ijin terlebih dahulu dengan suaminya. Nama – Usia – – Pekerjaan – Tempat Tinggal – Pengalaman Belajar Bahasa Arab – siap berkomitmen untuk menyelesaikan belajar di program BISA selama 8 pekan hingga tuntas. Bila mengundurkan diri atau dikeluarkan dari kelas (drop out) akan membayar infaq seikhlasnya-. TIDAK MELAMPIRKAN BUKTI UNDUH DIKTAT BERUPA SCREENSHOT ATAU FOTO MAKA PENDAFTARAN DITOLAK. Seorang sahabat mengingatkan saya dengan cara dia yang paling indah, hendaknya saya dapat membungkus rasa marah dengan penyampaian yang adem dan menyenangkan. “Kalau mau marah, coba deh pakai cara yang menyenangkan: jangan gitu yaa kalo kamu gitu terus nanti aku marah lho… nah sambil senyum manis deh, pasti jadi senang” gitu katanya. a. Doa menjelang berbuka. Doa ini dibaca sebelum anda mulai berbuka. Doa ini bebas, anda bisa membaca doa apapun, untuk kebaikan dunia dan akhirat Anda. Sebagai muslim yang baik, selayaknya kita cukupkan doa setelah berbuka dengan doa yang shahih ini, dan tidak memberi tambahan dengan redaksi yang lain. Doa dengan redaksi ini diriwayatkan Abu Daud dalam Sunan-nya no. 2358 secara mursal (tidak ada perawi sahabat di atas tabi’in), dari Mu’adz bin Zuhrah. 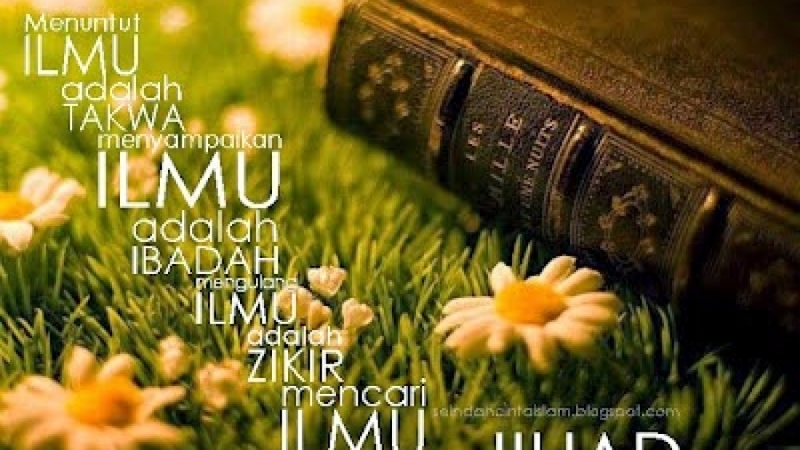 Sementara Mu’adz bin Zuhrah adalah seorang tabi’in, sehingga hadis ini mursal. Dalam ilmu hadis, hadis mursal merupakan hadis dhaif karena sanad yang terputus. Doa di atas dinilai dhaif oleh Al-Albani, sebagaimana keterangan beliau di Dhaif Sunan Abu Daud510 dan Irwaul Gholil, 4:38. Rasulullah shallallahu ‘alaihi wa sallam, apabila beliau berbuka, beliau membaca: “Dzahaba-zh Zama’u, Wabtalati-l ‘Uruuqu…” (HR. Abu Daud 2357, Ad-Daruquthni dalam sunannya 2279, Al-Bazzar dalam Al-Musnad 5395, dan Al-Baihaqi dalam As-Shugra 1390. Hadis ini dinilai hasan oleh Al-Albani). Keterangan yang sama juga disampaikan dalam Fatawa Syabakah Islamiyah, no. 7428. Membaca basmalah sebelum makan kurma atau minum (berbuka). Kesiapan diri sangatlah penting dalam rangka menghadapi segala kemungkinan yang akan terjadi di dalam kehidupan ini. Sedangkan terhadap yang telah terjadi, maka sikap yang harus kita miliki adalah ridho. Ridho terhadap apa yang akhirnya terjadi atau ridho pada hasil yang akhirnya kita terima setelah usaha yang kita lakukan. Ridho itu adalah keterampilan mental untuk realistis menerima kenyataan. Hati menerima kenyataan, dibarengi otak dan anggota tubuh yang berikhtiar terus untuk mencapai keadaan yang lebih baik lagi. Mengapa kita harus ridho? Karena jika kita tidak ridho pun, kejadian atau hasil itu tetap terjadi. Contoh sederhananya adalah apabila kita sedang berjalan di tengah lapangan golf, kemudian ada satu bola golf yang terlempar dan mengenai jempol kaki kita. Jika peristiwa ini terjadi pada diri kita, maka bersikaplah ridho. Karena tak ada untungnya juga bersikap tidak ridho, toh bola itu telah mengenai jempol kaki kita. Biarlah rasa sakit sejenak. Janganlah rasa sakit itu membuat kita bersikap menggerutu, mengutuk atau sikap apapun yang tidak baik. Dalam keadaan seperti di atas itu, justru terdapat celah kesempatan kita untuk beribadah. Yaitu ketika kita bisa memaknai jatuhnya bola golf tersebut sebagai teguran dari Allah Swt. agar kita tetap ingat pada-Nya. Sehingga ucapan yang terlontar pun adalah dzikir. Sebagaimana isi hadits di atas, bersikap ridho akan memberi nuansa tersendiri di dalam batin kita. Karena sebenarnya penderitaan kita saat menggerutu dan mengutuk itu bukan karena peristiwa jatuhnya bola pada jempol kaki kita. Melainkan karena kita tidak mau menerima kenyataan itu. Sehingga akhirnya kita pun merasakan penderitaan. Contoh lainnya yang banyak terjadi di tengah-tengah kita adalah sikap mengejek atau mencibir keadaan diri sendiri. Ada orang yang mencibir fisiknya sendiri hanya karena hidungnya yang pesek, atau kulitnya yang hitam, atau posturnya yang pendek. Atau ada juga orang yang mencibir dirinya sendiri hanya karena terlahir dari keluarga yang tidak kaya raya. Orang seperti di atas akan merasakan penderitaan. Penderitaan mereka bukan disebabkan oleh kenyataan yang terjadi, akan tetapi karena ketidakterampilannya dalam menerima kenyataan. Maka, tidak heran bila kita banyak menyaksikan orang-orang yang mengalami stres karena tidak terampil menerima kenyataan yang terjadi pada diri mereka, baik itu berkenaan dengan fisik penampilan, keuangan, karir, dan lain sebagainya. Oleh karena itu, apapun kenyataan yang kita hadapi, terimalah dan jangan berkeluh kesah, apalagi mengutuk atau menggerutu. Sikap ridho akan menghindarkan kita dari rasa menderita. Kenyataan yang berbeda dengan harapan akan jadi terasa ringan dan kita pun akan lebih bisa mengkondisikan diri untuk berbahagia. “Apakah kamu mengira bahwa kamu akan masuk surga, padahal belum datang kepadamu (cobaan) sebagaimana halnya orang-orang terdahulu sebelum kamu. Mereka ditimpa oleh malapetaka dan kesengsaraan, serta digoncangkan (dengan bermacam-macam cobaan) sehingga berkatalah Rasul dan orang-orang yang beriman bersamanya, “Bilakah datangnya nashrullah (pertolongan Allah).” Ingatlah, sesungguhnya pertolongan Allah itu amat dekat.” (QS. Al-Baqarah : 214). Bersikap ridho itu seperti bila kita menanak nasi, tanpa disadari air yang kita tuangkan terlalu banyak sehingga beras itu malah jadi bubur. Dalam keadaan ini, sikap yang kita lakukan bukanlah menggerutu dan menyalahkan diri apalagi memarahi orang lain. Namun, bersikaplah ridho dengan misalnya mencari daun seledri, kacang kedelai dan suwiran daging ayam. Ditambahi kecap dan krupuk sehingga bubur itu menjadi bubur ayam dengan citarasa spesial. Rasulullah Saw. bersabda, “Barangsiapa yang ridho (kepada ketentuan Allah) maka Allah akan ridho kepadanya..” (HR. Tirmidzi).